A six-year-old female spayed Beagle mix presented to the MedVet Columbus neurology service with a 2-month history of left sided vestibular signs with a rapid progression over about 5 days to a non-ambulatory state and nystagmus. The clinical signs had early on showed improvement with corticosteroids. Imaging studies by the neurologist revealed a brain mass via MRI. The mass was located on the right cerebellum with brainstem compression and measured approximately 2.5 cm. An impression smear as well as a formalin fixed portion of the non-encapsulated mass were submitted to our lab. The impression smear was stained with a Wrights stain and examined. Take a look at the slides below then read the microscopic description. Image 1. Impression smear stained with Wrights stain. 200x magnification. Image 2. Impression smear stained with Wrights stain. 500x magnification. The slides revealed a high cellularity consisting of a markedly atypical cell population. They are comprised predominantly of large atypical oval shaped cells observed mostly individually and sometimes in loose aggregates. These cells reveal large round to oval nuclei with finely to coarsely stippled nuclear chromatin and a large amount of often highly vacuolated light basophilic cytoplasm. Nucleoli are sometimes evident. The cells exhibit marked anisocytosis and anisokaryosis, high nuclear to cytoplasmic ratios, and binucleation and multinucleation. Mitotic figures are seen. Low to moderate numbers of lymphocytes, nondegenerate neutrophils and occasional plasma cells. Interpretation: Malignant neoplasia; most consistent with Histolytic Sarcoma. The biopsy sample was fixed and stained with H&E stain and examined histopathologically by Mark Chalkley BVSc (Hons), MANZCVS, DACVP. Images 3 (100x) and 4 (200x). 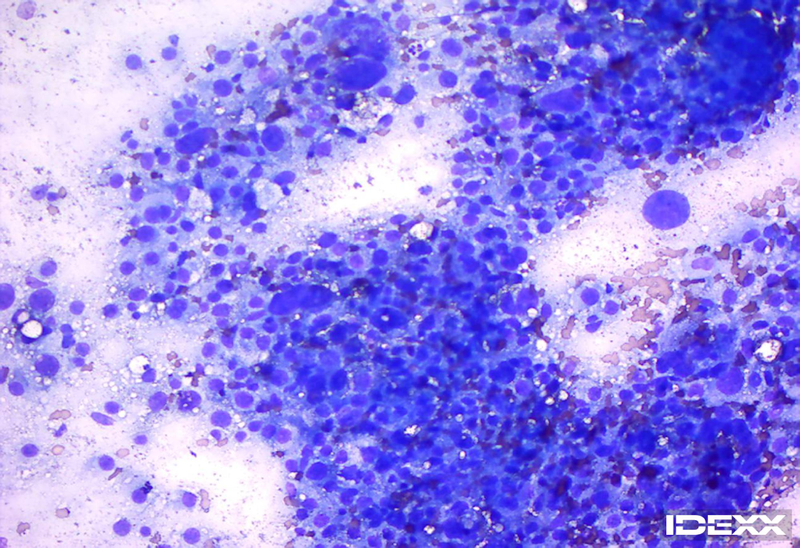 Biopsy sample stained with H&E stain. The sections above are composed of a densely cellular neoplasm comprised of cells arranged in closely packed sheets and occasional haphazardly arranged streams supported by a fine fibrovascular stroma. Tumor cells are large and round to oval with a moderate to large amount of eosinophilic, homogenous to vacuolated cytoplasm with distinct cellular borders. Nuclei are eccentric, round to reniform or oval with stippled or vesicular chromatin and have 1-3, prominent, deeply eosinophilic nucleoli. There is moderate anisocytosis and marked anisokaryosis with frequent karyomegalic and large multinucleated cells distributed throughout the mass. The mitotic index is greater than 30 per 10 high power fields. At 400x some mitoses are atypical in appearance. There are mild to moderate and diffuse infiltrates of lymphocytes, plasma cells and lesser numbers of neutrophils. Histiocytic sarcoma; Mitotic index: Greater than 30 per 10 high power fields. Angiolymphatic invasion is not observed. Surgical margins: Neoplastic cells extend to the edges of the biopsied tissue. This lesion was consistent with a localized histiocytic sarcoma of the brain. Histiocytic sarcoma is uncommon in this tissue and may occur as a localized mass or disseminated histiocytic sarcoma. These tumors are usually located in the cerebrum and most often involve the forebrain. Presenting clinical signs are often nonspecific but ataxia, paresis and behavior changes have been described. Pure breed dogs are most commonly affected with Bernese Mountain dogs, Retrievers and Rottweilers being the most common breeds but other breeds including Corgis, Beagles and Miniature Schnauzers have also described. This tumor most commonly occurs in middle aged to older patients (although Bernese Mountain dogs are often younger than those of other breeds). 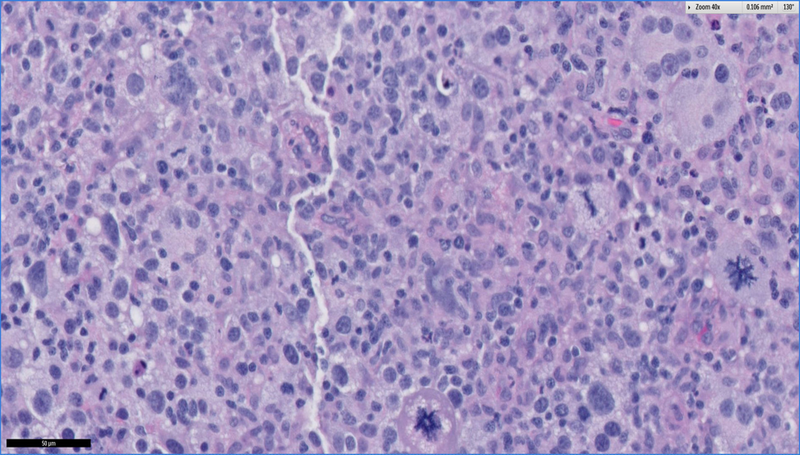 The cell of origin of this tumor within the brain is suspected to be resident dendritic cells (or less likely macrophages) of the meninges or choroid plexus. The median survival time of dogs with histiocytic sarcoma in one recent study was 170 days. However, patients with localized disease and surgical removal had significantly longer (406 days) (Dervisis, N.G. Clinical Prognostic Factors in Canine Histiocytic Sarcoma. Vet and Comparative Oncology June 23, 2016). Histologically, these tumors are non-encapsulated, usually extra axial and poorly demarcated with invasion of the brain parenchyma. 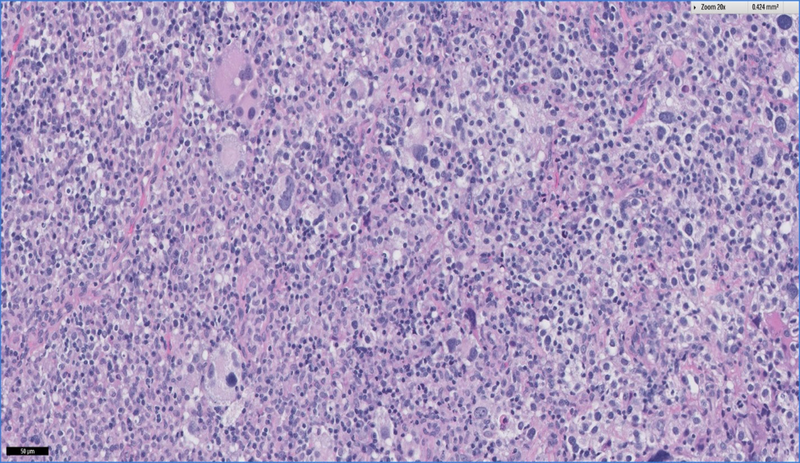 Immunohistochemical or special stains may be helpful with definitive identification of this tumor, especially if the morphology is not typical of a histiocytic sarcoma (which was not the case in this patient). Stains including MHCII, CD1, CD11, CD18, CD204 and lysozyme have been helpful for further confirmation of this tumor type. Post craniotomy this patient continued to gradually improve and was discharged 5 days later. The patient was seen again for a recheck after 2 weeks and was doing well clinically. We hope you enjoyed this edition of the IDEXX Challenge. 1) A. Thongtharb et.al. ‘Histologic and immunohistochemical studies on primary intracranial canine histiocytic sarcoma’J Vet Med Sci, 2016 Apr 78(4) 593-599. 2) T. Ide et.al. 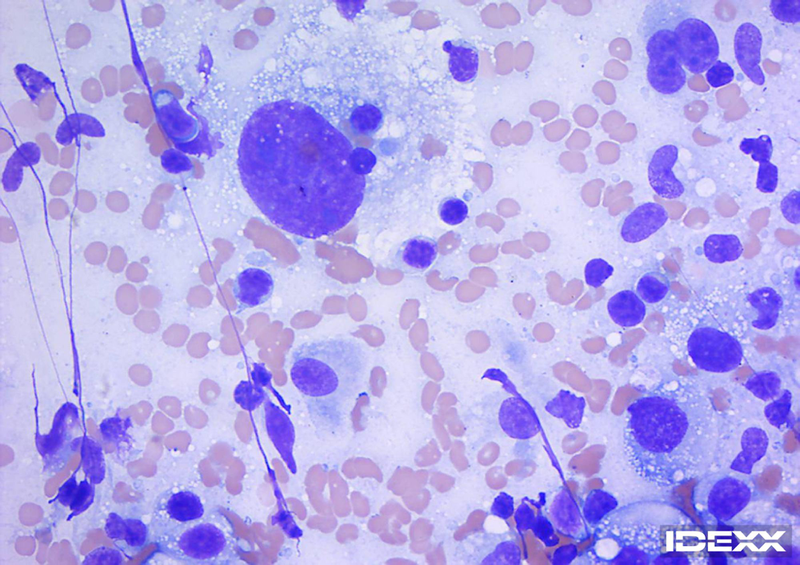 Pathological and immunochemical features of subdural histiocytic sarcomas in 15 dogs. J Vet Diagn Invest, 2011 Jan 23(1): 127-32. 3) N.G. Dervisis et al. Clinical Prognostic Factors in Canine Histiocytic Sarcoma. Vet and Comparative Oncology. June 2016.